35 acres of pure country living! This colonial is located in southern Lapeer County and sits back off the road for maximum privacy. This updated home features an open floor plan, wonderful kitchen that flows into the dining room, natural woodwork, 6 panel doors, freshly painted neutral color decor throughout, bamboo flooring in family room, new carpeting and plenty of natural light. Grand master suite with full bath and two walk-in closets. House offers 4 generous size bedrooms and 3 full baths. Walkout basement is waiting for your finishing touches. 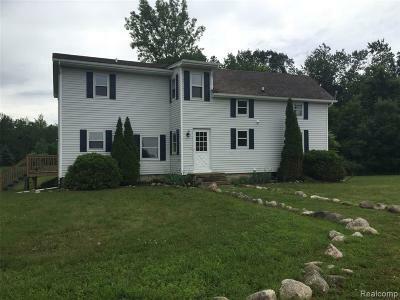 Mixture of farm, woods and yard with stocked pond make this a must see. Enjoy all the seasons with your wildlife neighbors including deer, turkey and more in your new home. Bring your walking shoes and take a stroll along the walking paths in the woods, perhaps picking blackberries. Seller is offering a 1 year America's Preferred Home Warranty.